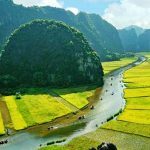 Take an unforgettable journey through the wonderful landscapes and captivating cities of Laos and Vietnam in 16-day Laos to Vietnam tour package. 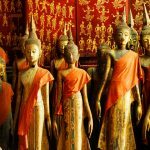 Start in Vientiane and end in Ho Chi Minh City, Indochina Tours takes you through Vientiane, Laos and 8 other destinations in Indochina. 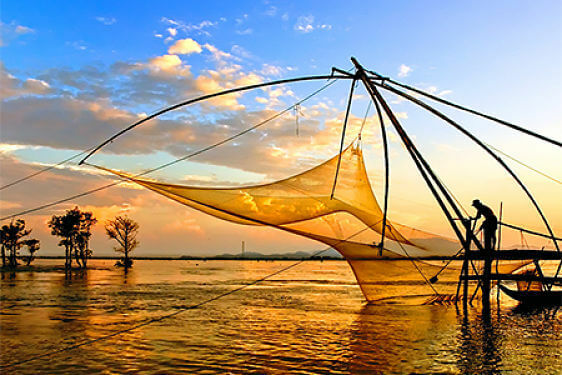 Explore the delights of Vientiane, Luang Prabang, and Hoi An, visit revered Buddhist temples and ornate palaces, discover mystical caves and colorful markets, cruise Halong Bay and the Mekong River and top off your adventure in bustling Ho Chi Minh City. 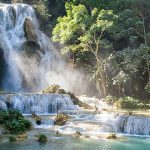 Laos to Vietnam Tour 16 Days provides accommodation in a hotel as well as flights, an expert guide, meals, transport and more. Enjoy your journey! Welcome to Laos! Upon arrival, you will be greeted by your private tour guide and driver, and then transferred to the booked hotel for checking in. The rest of the day will be your free time. After breakfast, start your journey with a full-day city tour. 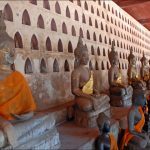 The easy-going city and temples tour begins at Wat Sisaket, one of the oldest temples in Vientiane, featuring over 6,840 remarkable Buddha images. Next, visit the stunning Ho Phra Keo, the famous That Luang Stupa. We also explore the COPE Centre, a charity working with victims of unexploded bombs and mines. Additionally, take time to wander the Talaat Sao (Morning Market), where you can find hundreds of shops selling superior silk weaving, metalwork, and woodcarving pieces. 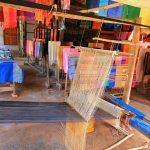 In the afternoon, visit the surroundings of Vientiane including Buddha Park, Ban Nong Buoathong weaving village, and end the day with a spectacular sunset dinner beside the Mekong River. 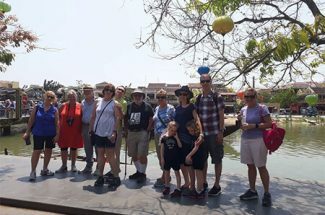 Following your breakfast, Indochina Tours departs Vientiane and drive along one of the most scenic routes in the whole of Asia to Vang Vieng which is located on a blend in the Nam Song River. This small and tranquil town is rapidly developed with the advent of tourists, but the beautiful scenery with a mixture of quiet water and limestone outcrops is unchanged for a century. 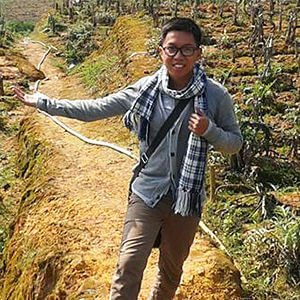 Along the way, we visit Ban Keun, which is famous for its salt extraction plant and a village of local Lao rice wine whiskey distillation. The next stop is the busy and colorful market of Talat market, where local hill tribes came to trade and shop. 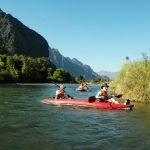 Upon arrival in picturesque Vang Vieng, you will cross the river and walk through the stunning mountain landscapes to visit some hill villages and caves. Other ideal options are taking a scenic bike ride of going tubing along the river. 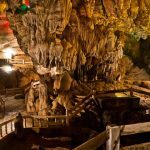 After breakfast, continue your discovery in Vang Vieng by visiting the most famous caves here, Tham Jang Cave, which once used by local people around 200 years as a hideout from Chinese invaders. 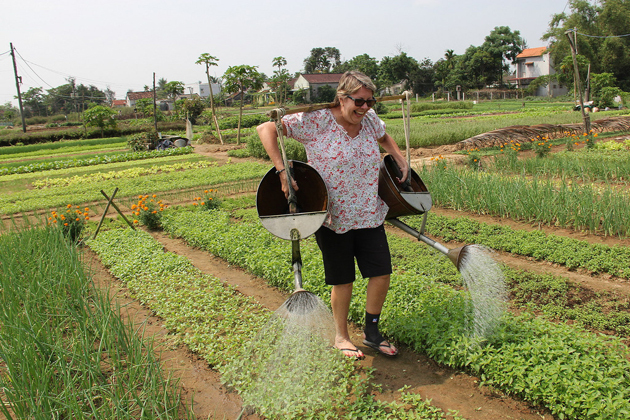 Afterward, head to the charming Ban Huai village where you can explore the different local lifestyle. 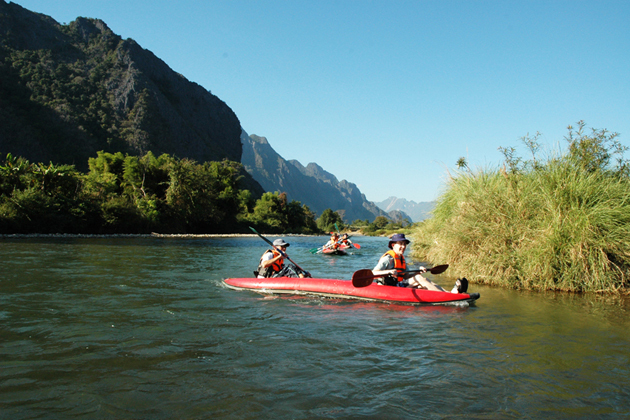 Here, you will marvel at the breathtaking mountains scenery which makes your trip interesting. Don’t forget to camera amazing pictures of these beautiful landscapes. 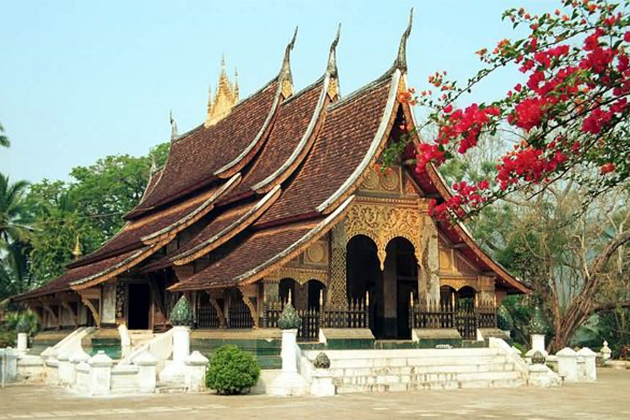 Your afternoon will be time for you to drive to Luang Prabang, which is considered “the best-preserved city in Asia”. 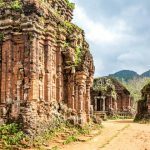 Set in Lao’s northern mountains, at the influence of the Nam Khan and Mekong river, the city reflects an intricate blend of French, Chinese, and Vietnamese influences, and has been recently named a World Cultural Heritage site by UNESCO. Upon arriving, after checking in, take time to relax. 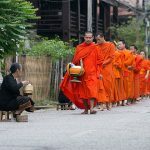 Consider waking up early this morning to witness the daily ritual of saffron-clad monks and their procession down the streets of Luang Prabang collecting offerings from the residents. If you choose to take part in the ritual, please speak to your guide at least 1 day in advance. They can prepare some food for you to give to the monks; otherwise, you can buy the food directly nearby. Besides, you can opt to observe the ritual in silence at an appropriate distance. Make sure that you dress appropriately and politely with your shoulders, chest, and legs are covered. After that, return to the hotel for breakfast or join the locals for a bowl of noodle soup. 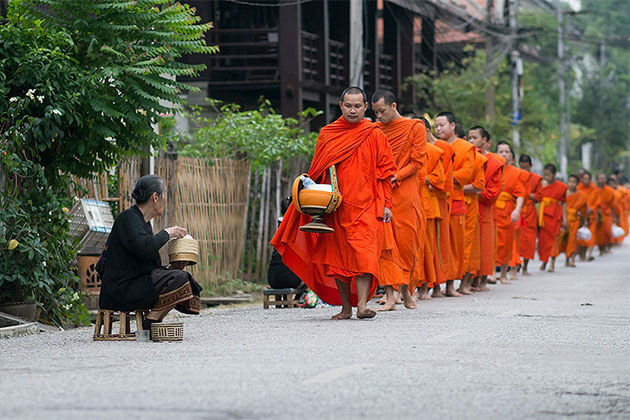 After your breakfast, take a morning tour through the highlights of Luang Prabang. 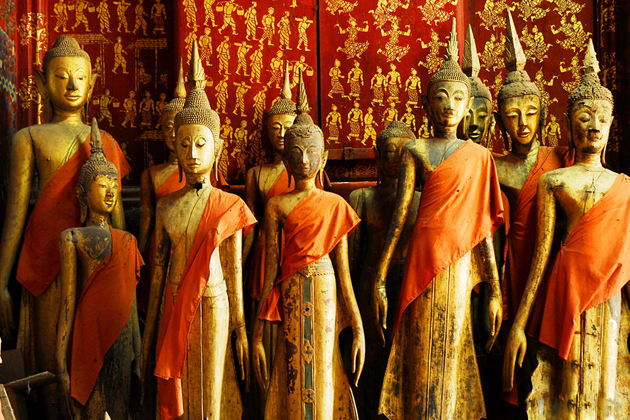 This full-day explores the rich culture and history of Luang Prabang as you visit temples, museums, arts center. 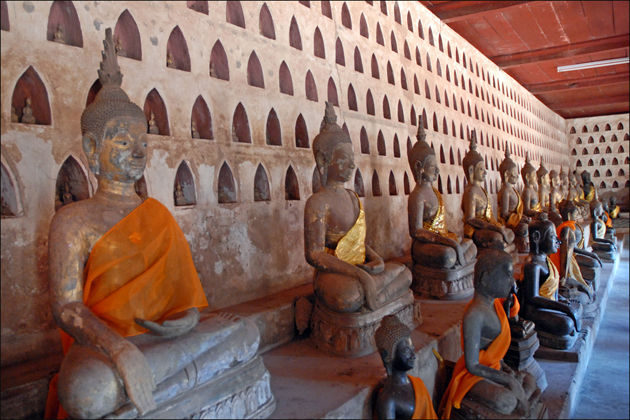 The first stop is Wat Xieng Thong, the most celebrated Buddhist temple not only in Luang Prabang but in entire Laos. 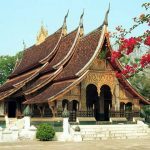 Then, walk through the historic former Royal Palace and discover the diverse cultures and traditions of Laos at the Traditional Arts and Ethnology Center. 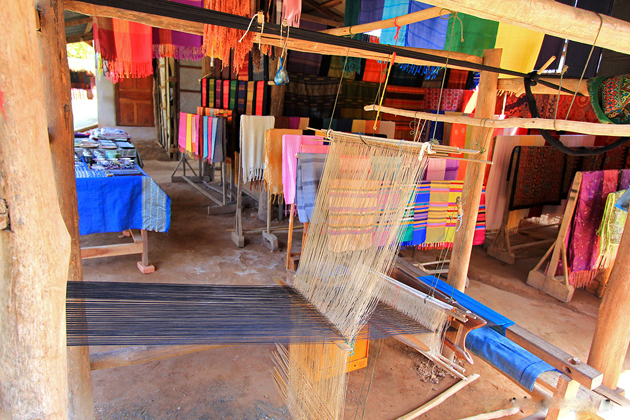 In the afternoon, you will stop at ethnic Khmu village of Ban Longlao Neung before heading to the nearby Hmong village of Ban Longlao Song. You will have a chance to observe the lifestyles of these two culturally different minority groups. 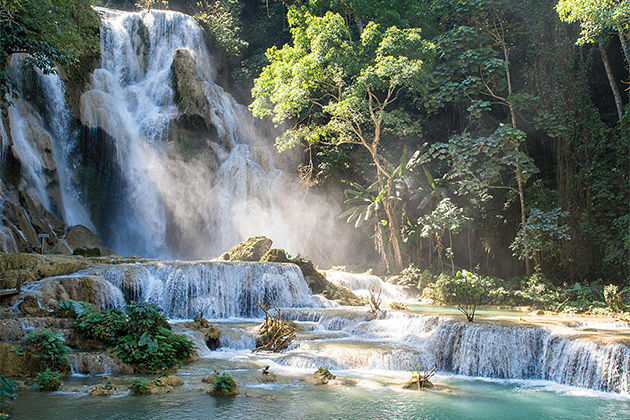 After that, don’t miss to visit Khuang Si Waterfalls, here a beautiful pool full of scared fish can be seen. Spend time bathing and relaxing around the turquoise pools below the waterfall. 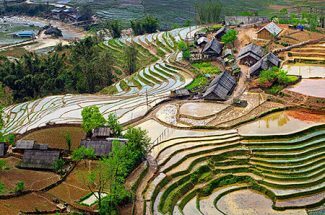 Today, your 15-day Laos to Vietnam tour package starts by heading out of Luang Prabang to a local farm to learn about the production of rice. 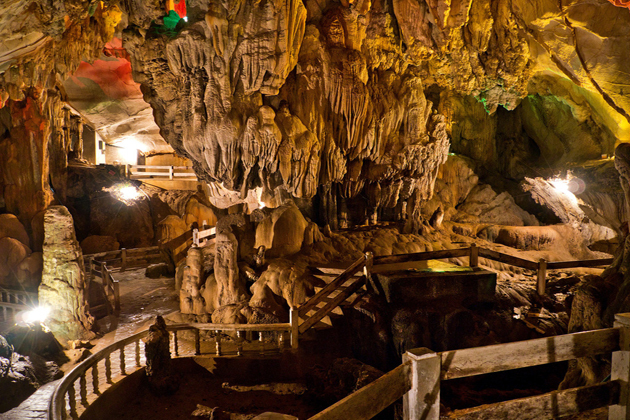 Later, join a boat trip to cruise up the Mekong River to visit the incredible Pak Ou caves crammed with Buddha images of all shapes and sizes. Then, return to the town stopping along the way at Ban Phanom village before taking an overnight flight to Hanoi. 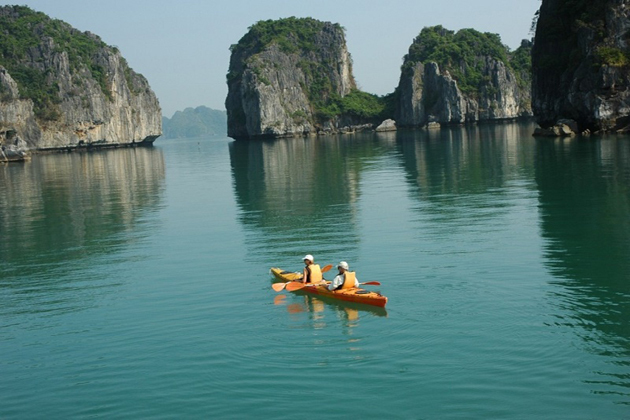 Indochina Tours offers free time for you to explore Vietnam’s gracious capital. 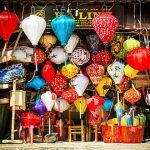 Vibrant traditional markets, dreaming lakes, ancient pagodas, and the priceless relics are all easily navigable by foot. 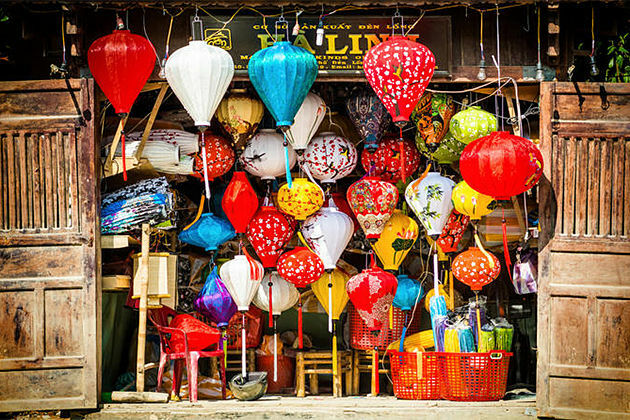 Wake up early in the morning to immerse the atmosphere of Hanoi by observing the daily life of local people. 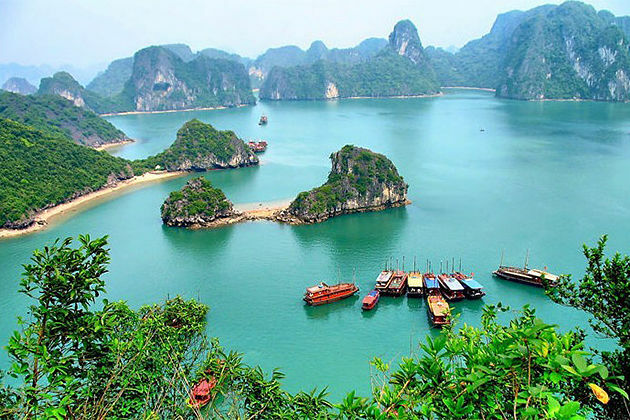 Then, take a moment to picture in your mind some two thousand rugged karst islands dappled with lush vegetation seeming to float on top of pristine emerald colored waters. This morning, a scenic drive will take us to this beautiful UNESCO World Heritage Site – Halong Bay where you will enjoy a junk boat cruise. Soak up the panoramic views from the sundeck, admire the natural beauty of the Bay and experience kayaking in a limited time. You will get a chance to get “off the beaten track” and explore the secrets of the sea within Bai Tu Long area. 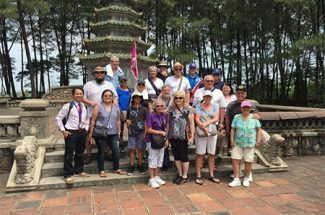 Following your prepared lunch, Indochina Tours takes you to the spectacular Tien Ong Cave which possesses pristine landscapes and a system of thousands of years old stalagmites and stalactites. 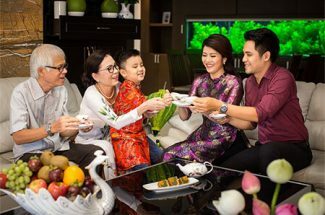 Later in the evening, you will return on board, observe a Vietnamese cooking demonstration held on the sundeck before settling down for a sumptuous seafood dinner. In the early morning, birds can start the day with a relaxing Tai Chi class on the sundeck or a traditional massage – the perfect way to start the day. 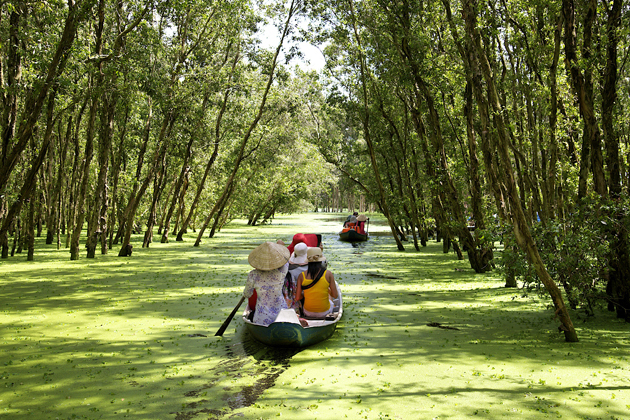 Before turning back to port, you will explore the floating village of Cua Van by kayak. Here you will witness the traditional and colorful floating wooden houses and have a chance to interact with the locals to know about their daily lives. 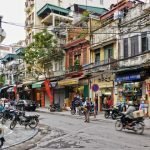 On our arrival back into Hanoi mid-afternoon, Indochina Tours will take you to soak up the maze of streets known as ‘the 36 streets of the Old Quarter’. Traveling by cyclo (rickshaw), the quintessential mode of transport in the charming Hanoi city, you will experience and observe traditional narrow-front tube houses with the chance to dip in some of the local specialties sold on street stalls from ripe fruits to steaming noodle dishes. Later, spend your evening to freshen up before boarding an overnight train on the ‘Reunification Express’ railway line to Hue. 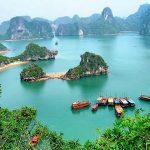 Another option to take a flight from Hanoi to Hue is also available. 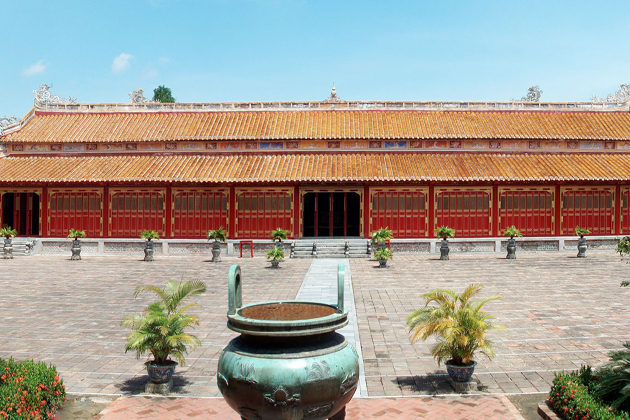 Upon arrival in Hue, continue your discovery by embarking on a guided sightseeing tour of the 19th century Nguyen Empire capital. 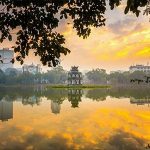 First, visit Thien Mu Pagoda, located beside the picturesque Huong River, with its ancient architecture, adds its charm to this beautiful natural setting. The sound of Thien Mu bell is like the soul of Hue, ever resounding over the Huong River flow winding its way in front of the Cidatel to the sea, resonating in the hearts and minds of the people and of tourists to Hue. Afterward, head to the Imperial Purple Palace of impressive ramparts, formal moats, and imperial palaces. 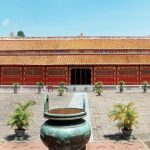 Your afternoon should be spent visiting Royal Tombs of the Nguyen Kings, here we will view the elaborate mausoleums of Emperors Tu Duc and Khai Dinh. As the sun sets, opt for a cruise in a long boat along the gentle Perfume River and immerse yourself in the peaceful atmosphere before returning to your hotel for dinner. 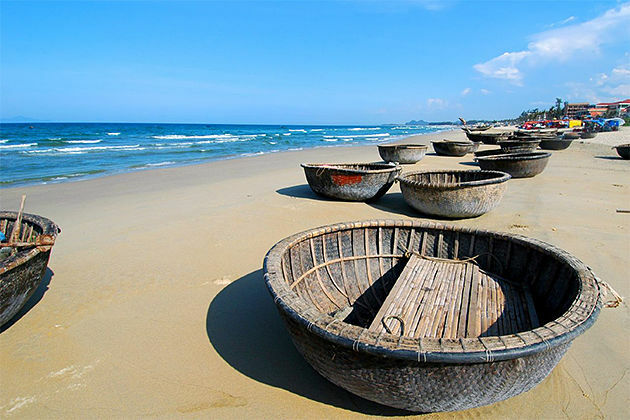 Following your breakfast, you will take a drive to Hoi An. Passing the scenic Hai Van Pass (Road of the Ocean Clouds), which offers magnificent views of beaches to one side and lush hills to the other. 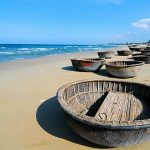 Along the route, we stop for a walk along China Beach, nonetheless one of the top tourist destinations in all of Vietnam. A miles long, gorgeous white sand beach lies along the edge of clear blue waters, which is rapidly becoming an attractive destination for tourists all over the world. You also can enjoy a refreshing swim in the sea before continuing our journey along the coast road to Hoi An. 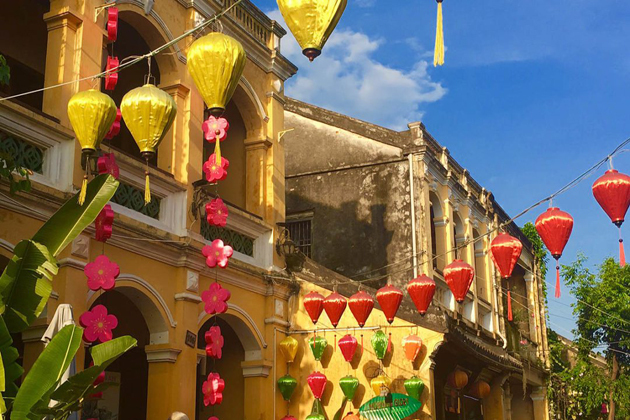 The charming, old-world trading port of Hoi An with its cobbled streets, traditional homes, and tiny shophouses is a perfect place to lose yourself in a bygone era. 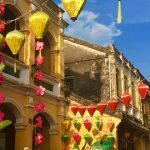 The first impression for tourists when reaching this charming ancient town is a town full of boutique restaurants, hip cafes along the waterfront, delightful craft shops and artisans including some of Asia’s best bespoke tailors. 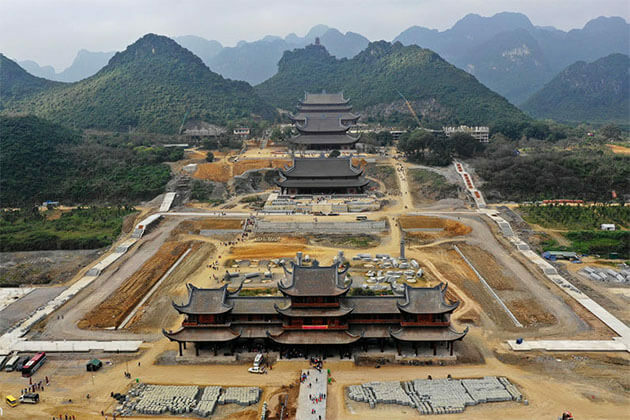 You will take a short walking tour of the enchanting historical town, passing through the following attractions: Chua Ong Pagoda, Chinese Assembly Hall, 200-year-old Tam Ky house, former merchants’ homes, and the 400-year-old Japanese Covered Bridge. Depart at your hotel at 8:00 A.M, you will ride by bicycle to Tra Que Village, experience a day of living and working with the local farmers in this village. Welcome drink for rest and walk through the vegetable gardens where local farmers work on their fields using the traditional methods of hundreds of years ago, without machinery. 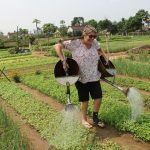 Besides, you can join gardening activities in preparing the land, fertilizing with seaweed, raking the ground, sowing and join cooking with ‘Tam Huu’ spring roll, ‘Banh xeo’ – a local pancake of locals in Vietnam middle regions. Then, enjoy a delicious lunch of local specialties what you have cooked. After lunch, biking head back to the hotel and take free time. Today is free for you to relax or further sightseeing this ancient town. 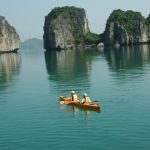 Indochina Tours recommends you to take a relaxing rowboat journey along the river or spend the day lazing by the beach or the hotel pool. 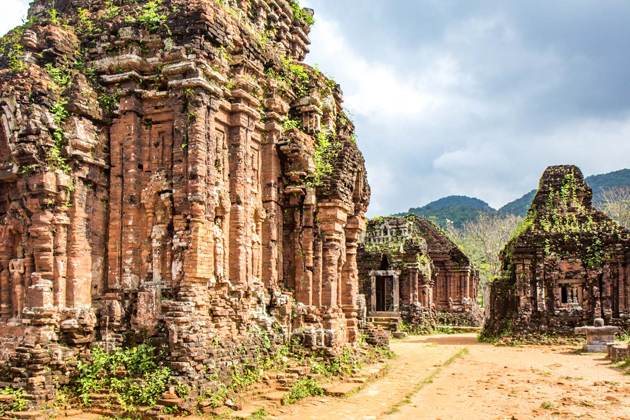 Other options include taking an excursion to the holiest and evocative of Vietnam’s Cham sites, My Son or to the site of My Lai massacre memorial, Quang Ngai. Enjoy your day! 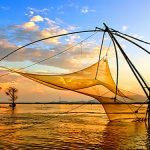 In the early morning, you take a short flight from Da Nang’s airport to Ho Chi Minh City and head to the Mekong River in Can Tho Province. 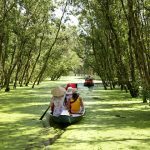 Often considered as the ‘rice bowl’ of Vietnam, the fertile Mekong Delta is famous for its abundant harvest of tropical fruits, flowers, and rice, as well as it fantastic views while boating along the canals. 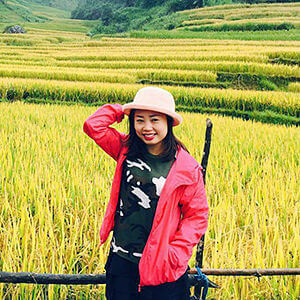 Taking your sampan from Vinh Long, you will cruise Cai Be’s maze of waterways visiting local cottage industries that produce popcorn, coco candies and paper along the way. Here, you can observe and experience the process locals make such candies or paper. Lunch is prepared and served in a traditional wooden home on Dong Hoa Hiep Island. 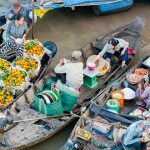 After breakfast, continue your Mekong River Cruise by boarding a motorboat for sightseeing the Cai Rang Floating Market which is the biggest and most colorful floating market in the Mekong Delta’s region. 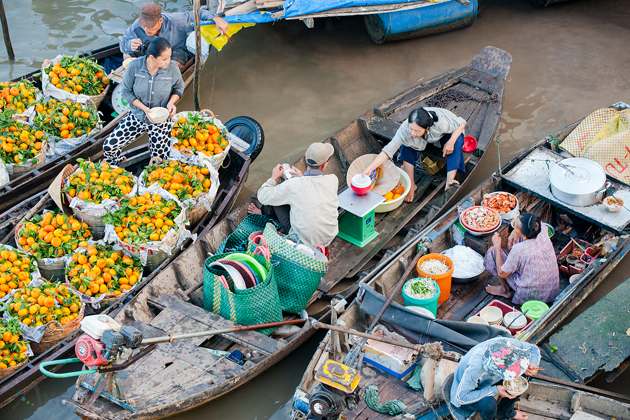 In the early morning, the river has become a busy commercial site where hundreds of boats packed with fruits, vegetables, and foods…line along the river and are ready for trading. After the Cai Rang Market, continuing cruising through small creeks to a local orchard and enjoying tropical seasonal fruits before driving back to Ho Chi Minh City. 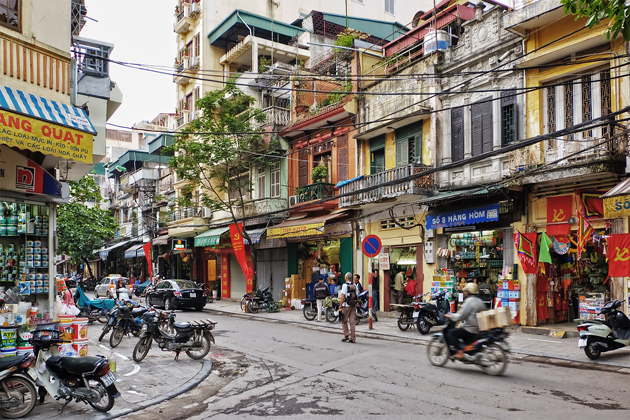 Back to the modern Ho Chi Minh City in the early afternoon; spend the time to walk through the highlights of this bustling city. Soak up the beauty of sleek skyscrapers, gourmet restaurants, designer malls, swanky bars, and spas are scattered between ancient pagodas, colonial-era landmarks, and lively street markets. 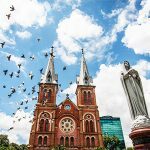 Indochina Tours offers your walking tour of Ho Chi Minh City including visiting the Notre Dame Cathedral, Old Post Office, and the sobering War Remnant. Your evening is free for you to explore and relax. 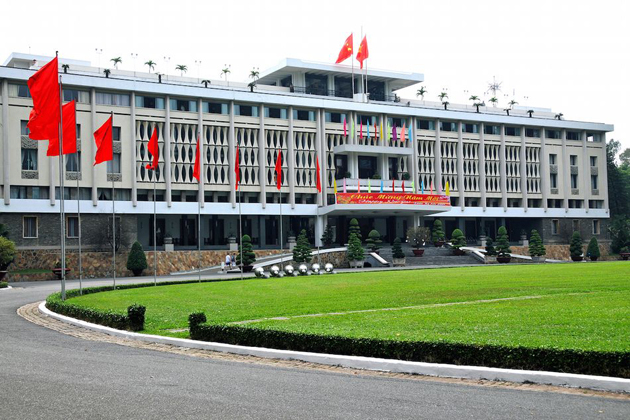 Today offers time in Ho Chi Minh City till your departure transfer to the airport. 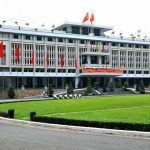 Opt for a relaxing foot massage, shop for souvenirs at Ben Thanh Market or visit the grand Independence Palace are fascinating activities you can experience before ending up your 16-day Laos to Vietnam Tour. 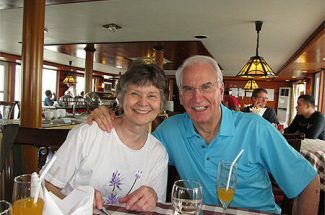 We wish you to have a memorable time with our itinerary.